Bruce started his audiology career as a hearing aid technician in 1963, joining Scrivens at the age of 20. In 1967 he formed his own practice and in the same year gained Fellowship of the Society of Hearing Aid Audiologists. This commitment to practice and the profession continued, with Bruce holding various Chair positions within the BSA and for other agencies and societies. He was a founder member of the National Hearing Aid Museum. He was awarded the Ruth Spenser Prize in 1987. Between 1992 – 1994, Bruce became Chairman of the BSA, as the first Chairman from the private sector, and was awarded Honorary Life Membership of the BSA in 2010. Bruce was diagnosed with skin cancer 10 years ago shortly after retirement. Lung cancer developed some years later. 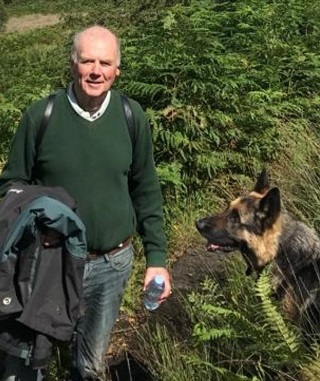 He has 6 children and 12 grandchildren ranging from 6 to 24, and enjoyed life living on a farm in the High Peaks surrounded by sheep, pigs, hens, ducks, cats and his German Shepherd dog called Arthur. Bruce was a passionate musician with the release of a charity album planned for this year with his band Spontaneous.